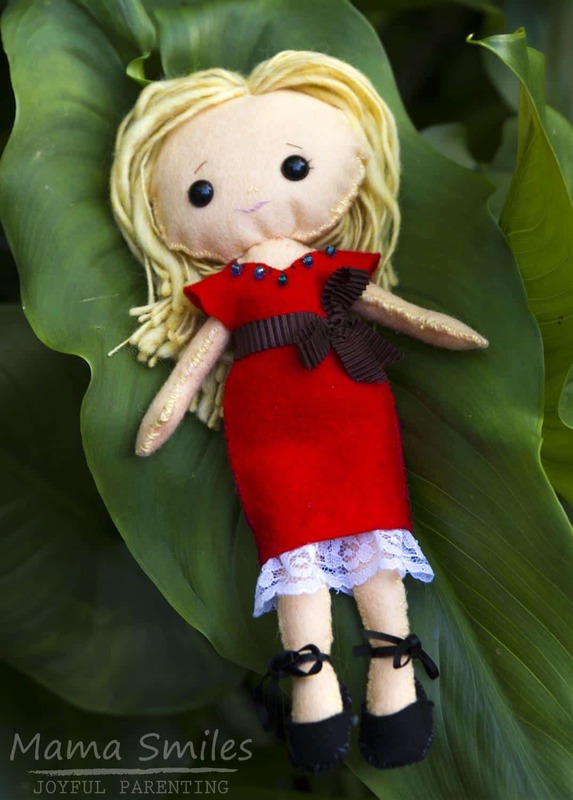 Can you believe that six-year-old Lily was able to this adorable doll using the instructions in the book My Felt Doll? I was a little dubious when she told me that she wanted to sew a felt doll using the book, but I shouldn’t have doubted her. I helped with the beads on the dress, the eyes, the lace on the bottom of the dress, and with lots of needle threading and knot tying, but she pretty much made this on her own! She even spun the hair using a drop spindle and wool roving. We don’t have the whole spinning process down – I think I need to try a Bluprint spinning class to help her perfect her technique. When it comes to crafting, Lily adds some serious patience and perseverence to her signature grit and determination for a real win! Funny thing: looks like March is doll making time. Last year I made this Daddy doll, also out of felt! The arrival of my newest niece was the most exciting thing that happened in March! I got to be there when she arrived, and loved taking photos of her. My mom flew out to help, so we get some bonus time with Grandma, too! I’m adding “always capture a few photos right by the window” to my newborn photography tips – I love how this photo turned out! Goals… I was pretty ambitious in my goal-setting for March, and I only got about half of them done. Lily finished her doll, we planned out our road trips (switched one of them to flight, actually), and I did pretty well at making one on one time happen for all four kids. Mike and I sort of passed the “date” goal – we went to Costco and Fry’s on our own without the kids. We still need to go on a real date, though. I finished Beyond Sing the Woods by Trygve Gulbranssen and read Yang Huang’s Living Treasures. I recommend both books; both are serious reads. I made progress on Lily’s quilt, but I still have about 36 curved seams to sew before I can trim down to rectangles that should join together pretty quickly. Photo editing time was mostly spent editing newborn photos and pictures for a local event that I photographed; I have personal photo editing sitting in my to-do list. I didn’t work on the photo book at all, and I also didn’t work on my Bluprint illustration class. Catch up on photo editing. Mindful living and gratitude. Finish the rectangles for Lily’s quilt. Learning. Make one photo book. Gratitude and mindful living. Watch at least one more illustration class. Learning. Keep spending one-on-one time with the kids. Mindful living. Enjoy mini at-home dates with Mike. Because he is traveling on the days when a proper date might work. I highly recommend building LEGO sets together as mini dates! If you follow me on Instagram you know that Mike and I are slowly working our way through this Parisian restaurant set. Mindful living and gratitude. Great job by Lily on the doll, and that is a spectacular newborn photo!! Want to fly over to do mine at the end of this month? ;) Have a wonderful month of travel and intentional fun!! I wish I could! I hope this last month of pregnancy goes well for you. Whoa, Lily is getting to be a serious crafter. This doll is quite amazing. Wishing you all the best in reaching your April goals! Sewing is definitely a “thing” for her. She is starting a doll like this for Anna now. Ugh, that reminds me I have several photo books I wished to complete, I’m just putting it off. They are hard to carve out time for! What a beautiful photo! Your April sounds like our March. I hope your trip is wonderful! Thank you! We just got back from a great visit with my brother and are looking forward to our big April trip. It is a really wonderful book! The dolls take quite a while to make, but they are really fun, and the book is full of accessories that will fit the basic doll frame so you can sew and sew and sew. Taking on dates with your husband is such a great goal, and I love that you’re recognizing that a mini-date counts. My husband and I need to get better at this, and probably starting somewhere small would be best. Your newborn photo is beautiful! Congrats on your newest niece. Thank you, Kate! I find that change is all about baby steps. Her doll is so cute! I love that you are taking an illustration class! I love that doll! Now I am inspired to make one for my youngest too. Your photography is so beautiful. That picture is precious! I love the class idea! I need to do a class every now and then to keep me learning! Well done, Lily, and gorgeous photo, MaryAnne!